Western Saharan refugees are losing patience after 40 years living out of their country. A referendum on independence was promised a long time ago but it has not come. Some are thinking about ending the 24-year ceasefire with Morocco. Dominik Sipiński reports. This November 2015 refugees from Western Sahara will mark the 40th anniversary of the occupation of their country by Morocco. Many of them will talk about attacking the 2,700-kilometre wall that separates them from their home. The Saharawi people are patient, but there are limits. There are about 120,000 refugees and they live in five camps in western Algeria. The younger refugees have never seen their country. Ilbu is a young Saharawi refugee. He says, ‘We were born here. We live here. But we do not want to die here in the desert, because this is not Western Sahara,’ His dream is to become a photojournalist. The UN helped Morocco and Saharawi sign a ceasefire in 1991. People saw it as a step to independence. The international community decided on a referendum for the Saharawi. It is a usual way of solving problems after colonialisation. MINURSO is a UN peacekeeping mission. It planned to have the referendum as early as 1992. Since then, Morocco has stopped the process as it does not want to give away control over Western Sahara. The UN has been too weak to force progress. The Saharawi have no power and are left angry. The referendum is no more likely today than it was in the 1970s, when the UN first suggested it. Bouhabini Yahia is president of the Saharawi Red Crescent. He says, ‘We do not ask for much. We do not ask for money or help. We only ask for a referendum so we can get independence for our country.’ Yahia is a humanitarian. He does not want to say openly what most refugees think: that no one has listened to their appeals for 40 years. The problem began in 1975. Spain was a colonizer of the territory and had terrible problems. Its dictator, General Franco and his government, was dying. Western Sahara is a colony the same size as the UK, but with fewer than 100,000 people. Spain did not want it and its problems. Spain secretly divided Western Sahara between Morocco and Mauritania. Both countries sent in their armies. Morocco also brought in over 300,000 civilians, in the so-called Green March. The Saharawi nomads had a good standard of living but there were very few of them and they were poorly armed and had no chance of fighting back. The Moroccan air force forced the Saharawi into Algeria by bombing them. The nomads moved into refugee camps and started a war. They had some success and forced Mauritania to leave and sign a peace agreement. But Morocco was too strong for them. A situation wth no possible chnage? In the 1980s, Morocco built a wall across the desert with landmines to keep the Saharawi away. The major countries showed no interest in the situation. None of them recognized the independence of the Saharawi Arab Democratic Republic (SADR). This was started by the leftist and secular Polisario Front in 1976. 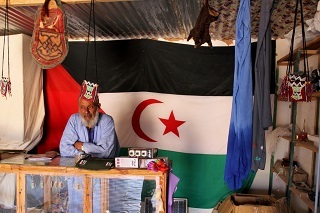 Only the African Union (AU) supported the Saharawi and made Morocco leave the AU. Today Morocco is the only African country not part of the AU. The 1991 ceasefire made this situation. Morocco controls about three-quarters of Western Sahara, including all of its territorial waters, which are rich in fish and, possibly, oil. The SADR is now a kind of state with ministries, elections, and a football team. It controls the rest of Western Sahara and is called the Liberated Territories. ‘This is a very unusual group of refugees – they came here for political reasons, not seeking opportunities. There are no opportunities here,’ says Yahia. ‘From the very beginning, they had a political plan to build a state in exile, easy to move to the independent Western Sahara.’ For the Saharawi who stayed in occupied Western Sahara there are very few rights. Moroccan police stop pro-independence movements. Foreign journalists are banned from the territory which Morocco calls the ‘Southern Province’. Bene is pessimistic but he still thinks that a peaceful path to independence is possible, if the Saharawi can promise more economic benefits to the US and the European Union. But many of the other refugees have lost hope. ‘People see that the UN does not work. They see that only force works. We have a reason to fight, and as Muslims we believe that if we die for our country, we go to heaven,’ says Ilbu. Polisario is the only party in the SADR and it wants to find a peaceful solution. Every year, there is hope that the UN will support the MINURSO and at least give it the right to monitor the human rights situation in the occupied territory. It is the only UN peacekeeper without this right. The mission’s mandate is renewed annually, but because of French support for Morocco, changes are always stopped. Last year, SADR’s prime minister, Abdelkader Taleb Omar, said that if this continues, he will look at other ways of taking action. The angry young people of Western Sahara have been saying the same thing for a long time and they are more open with their opinions. MINURSO is worried and its concerns are passed on to the UN Secretary General in their annual reports. 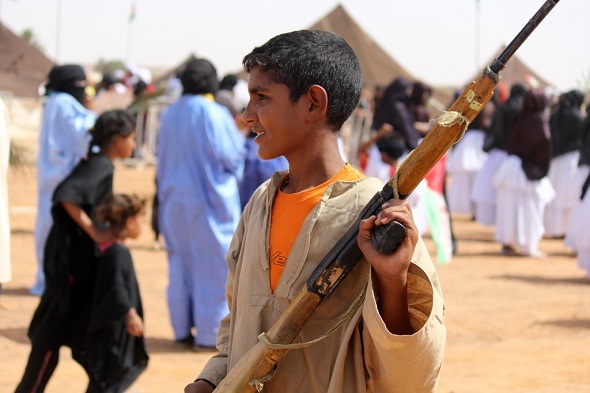 Informally MINURSO representatives in Tindouf, an Algerian city near the camps, say that, if there is violence, they can do very little to stop it. Dominik Sipiński is a freelance journalist. He reports on conflicts, global politics, and social issues. This page was last edited on 14 November 2015, at 16:13.